What do you see when you imagine your dream kitchen or bathroom? For many, these rooms are meant to be an oasis of clean, bright elegance with hard surface countertops. 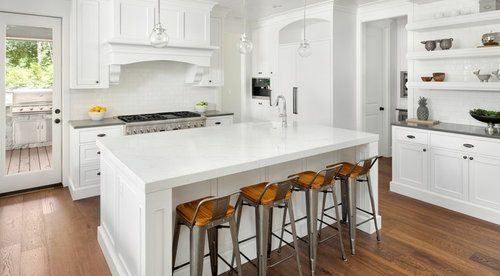 In the sections below, we will explore two types of these countertops, marble and quartz, to help you decide if one is right for you. Marble countertops are part of the definition of luxury in a home. They are made from raw, natural marble that has been quarried, sliced, water blasted, buffed, and polished into the shining slabs available in countertop distributors’ showrooms. Quartz countertops, on the other hand, are manmade. They are composed of ground natural quartz with polymers, resins, and pigments, at a ratio of anywhere from 93 to 97 percent quartz to 7 to 3 percent synthetic materials. This combination gives them a clean, polished appearance. If you are looking for elegance and stately beauty, marble with its natural color and veining is hard to beat. However, some of the more expensive quartz designs mimic natural marble. The main difference in appearance is the consistency of color and pattern. Since quartz is manufactured, each slab will be the color, texture, and pattern seen in the showroom sample. Marble is not as easy to choose. Each piece must be selected individually, and one slab will not exactly match another if you need more than one piece for your space. Both marble and quartz may alter in appearance over time. Marble tends to darken slightly with age. With quartz, the enemy is the sun. UV radiation will cause the resins and polymers to yellow over time, so a quartz countertop should always be protected from direct sunlight. Installing marble or quartz countertops is a complicated process that requires a professional to carefully measure, level, and secure the slabs on the kitchen or bathroom counters. The major issue with marble is seaming two together if one piece will not cover a set of cabinets. The unique quality of a natural stone like marble means that attaching two different slabs will always leave a visible seam. A skilled professional will be able to do a better job at making the seam less obvious. Quartz, on the other hand, is consistent in its design and is easier to seam. The major installation issue with quartz is that it is hefty and requires careful cabinet preparation to ensure a sound foundation. Working with this heavier material makes the installation of a quartz countertop more difficult. Marble countertop slabs are more expensive than quartz, depending on the quality chosen. However, the labor cost for quartz is higher due to the complicated installation. Therefore, the cost difference is not dramatic. Quartz, however, runs slightly less at $55 to $75 per square foot. For kitchen cabinets measuring 30 square feet, the cost for the quartz countertops would be about $1,800. Installing them would take 5.5 hours and cost about $360. Adding other factors such as a sink cutout at $100 and finished edging at $10 per linear foot, the total for the project will be approximately $3,760. Of the two countertops, quartz is the more heat resistant. The hard quartz and resin composition help it to withstand high heat. Marble is also heat resistant although not as much as quartz. Pans should never be put directly out of the oven onto the cold marble surface as this may cause a crack due to the sudden change in temperature. Marble is not as durable as quartz in everyday use. It is porous, more so than other natural stone countertops, and acidic substances will leave a stain if not cleaned up quickly. Wine will also stain marble if not immediately removed. However, you should not use just any chemical cleaner on marble. Some chemicals will damage the finish. Always check the label to see if a substance is meant for use with marble. Also, marble needs to be professionally sealed after installation and resealed periodically afterward. Quartz, on the other hand, is non-porous and stain resistant. It can be cleaned with warm water and soap and never needs sealing. Marble is also softer than quartz and etches with use. Etching is the colorless watermark left on marble with everyday use in the kitchen or bath, especially around a sink or tub. These marks can be removed with warm water and a soft cloth or with a cleanser recommended for marble. Quartz, with its very hard surface, will not show etching or scratches with everyday use. If they are properly maintained, either of these hard surface countertops can last the lifetime of the home. The marble is more likely to show its years, however, since it is not as stain resistant and scratch resistant as the quartz. In the past, reports surfaced about the emission of radon from natural and manufactured stone such as quartz. Radon is a colorless, odorless gas that is a potential cause of lung cancer. It is produced when radioactive elements decay. However, extensive testing has shown that engineered stone such as quartz emits almost no radon. Marble is not a natural stone that has been linked to radon emissions. Neither marble nor quartz is a good option for outdoor use. Marble’s porous nature and its tendency to show stains and watermarks make it a poor choice. Quartz is susceptible to yellowing when exposed to direct sunlight, and this makes it undesirable for outdoor living as well. All solid surfaces make a good resale choice for your home. However, the type of surface used should match your price point. A home in a lower price range should probably have a less expensive quartz choice than a high-end marble or vice versa. It is important not to spend more than your home’s value requires. How much does it cost to install marble or quartz countertops in my city? 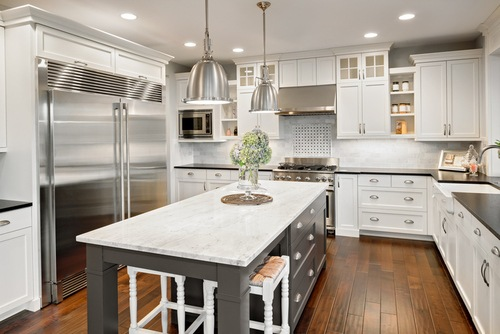 Cost to install marble or quartz countertops varies greatly by region (and even by zip code). To get free estimates from local contractors, please indicate yours.